UPDATE>> The power outage affected the entire campus, according to Jason Wang, senior director of Physical Plant Management (PPM). Several CSUN campus buildings experienced a brief power outage just before noon Thursday due to a Los Angeles Department of Water and Power equipment failure, officials said. More than 90 percent of the campus had been restored shortly after 1 p.m., according to a CSUN emergency notification. Many campus buildings including the Oviatt Library, Manzanita Hall, Sierra Center, University Hall, Bayramian Hall, the Valley Performing Arts Center, and the art department all experienced power outages at approximately 11:42 a.m.
Other than a delay in University Hall when a generator failed to turn on, full power has been restored to the the affected areas by 11:48 a.m. The cause of the outage remains unknown. The power outage may be related to a blackout near 18033 Ventura Blvd. near Lindley Avenue in Encino which is currently ongoing, said Albert Rodriguez, spokesperson for the Los Angeles Department of Water and Power. The Encino power outage began at 11:30 a.m. and is currently affecting 460 customers. Rodriguez said the same circuit may have affected the Northridge area, as power is restored incrementally. Customers in Encino can expect the power in their area to return in two to three hours, Rodriguez said. 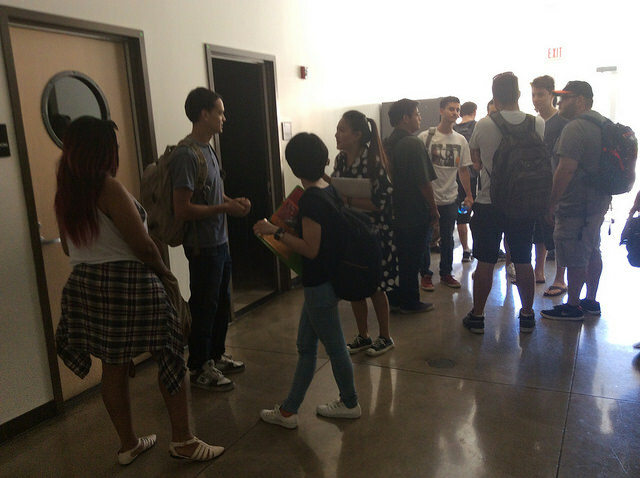 All classes were still in session, according to a CSUN alert.